In my childhood I read a story of Shirshendu Mukherjee where he wrote the definition of a good cook “He/she is a good cook who cooks tasty food with fewer ingredients and making less waste”. I was very young that time but still believe in that. It will reflect in my recipe today. I hope that you will like my simple, easy recipe. Bottle gourd/Lau is a wonderful vegetables but I will talk about bottle Gourd skin. Its skin has nice taste. Normally I like to fry bottle gourd’s skin with potatoes. It is a very simple recipe; the only tough part is to slice the skin. 1. Wash sliced bottle gourd’s skin and drain the water. 2. Mix ½ teaspoons salt to the skin properly. 3. Heat the pan with oil on medium high and add onion. 4. When onion becomes soft, add the sliced skin and turmeric. 5. Fry it 2-3 minutes and stir occasionally. 6. Add sliced potato and chillies and fry it till potato becomes cooked. 7. Check the salt and turn off the heat. 8. 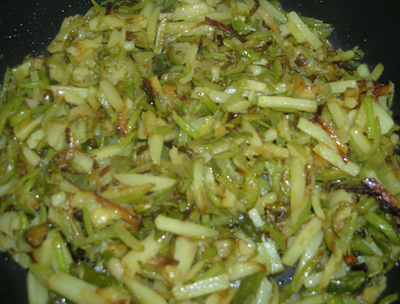 Serve lau er kosha bhaja with rice. Thank you so much for sharing your great and easy to make recipes, I am really much appreciated!